Pictures from the conference as well as around Austin (primarily Rainey St. because it's awesome. 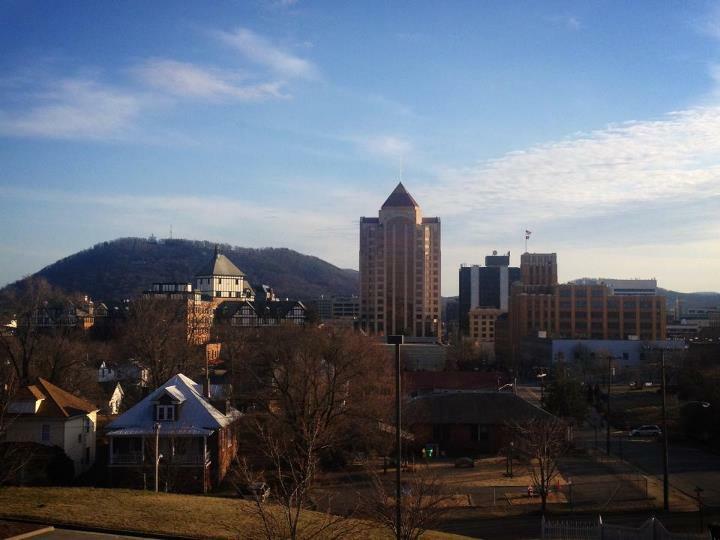 Ventured out into Downtown Roanoke again last night for dinner. As I often do, I consulted Yelp to figure out what to go for. I didn't want to spend a ton of money after the Regency Room the night before. So, I set my Yelp query up to look for less expensive places that were in the Downtown Roanoke area. Yelp highly recommended Alejandro's Mexican Grill. The website heavily touted their Salsa Bar, and I love options when it comes to salsa. They also state they have been voted "Best Margarita" in town and they're on special on Sundays. Easy decision. I must say, the appeal of a 27oz. margarita for $4.99 should be something I don't need to explain. I figure at that price it doesn't even really have to be an excellent margarita. I've paid more for mediocre drinks. That said, this was anything but a mediocre margarita. It's not going to go into my top 10 or anything crazy like that, but it was strong and tasted fresh so no complaints here. I think there were roughly 16 salsas on the Salsa Bar. If you order an entrée, the Salsa Bar and unlimited chips comes with it. If you just want the Salsa Bar, it's $3.99. I'd say it's worth it. All of the salsas are freshly made, The salsas that are labeled "Hot" really are hot so that was a huge bonus. Anyone who knows me knows I enjoy spicy things. The Salsa Casera was my favorite. Chile Arbol (including all of the seeds), tomato, onion, cilantro, and probably a bit of lime. Very good. As I usually do when I go to a Mexican restaurant, I ordered a combo. A fairly boring one too. 2 ground beef crunchy tacos and 1 shredded chicken enchilada with rice and refried beans. The reason I go with these things is because I really like them and they are usually done well since they're not complicated at all. Not to mention, combos like this are usually the most economical way to get a bunch of food. As stated, I had a goal of keeping the cost down. Those who are more ambitious, click here for the menu. This food was not disappointing in the least. Very flavorful and the salsa casera made everything nice and fiery. All in all, a great meal. I would definitely recommend checking out Alejandro's if you find yourself in Roanoke. Food is such a wonderful part of life. Every now and then you get to have an opportunity where a meal is truly fantastic from start to finish. The service is spot-on and the food is flawless. That was my experience last night at the Regency Room here at Hotel Roanoke. The appetizer I chose off of their wonderful menu was the Truffle Risotto Fritters. 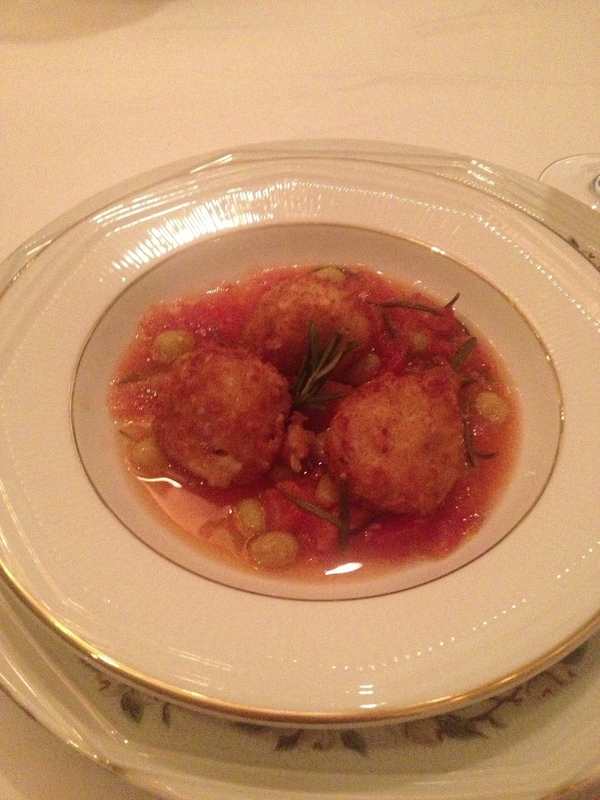 The menu describes this dish and having a country ham and mozzarella center served in a tomato coulis. I have to admit, it was the first thing I noticed on the menu. As an admitted foodie, the words "truffle" and "risotto" translate in my brain to "must try". I wasn't disappointed. It was amazing. 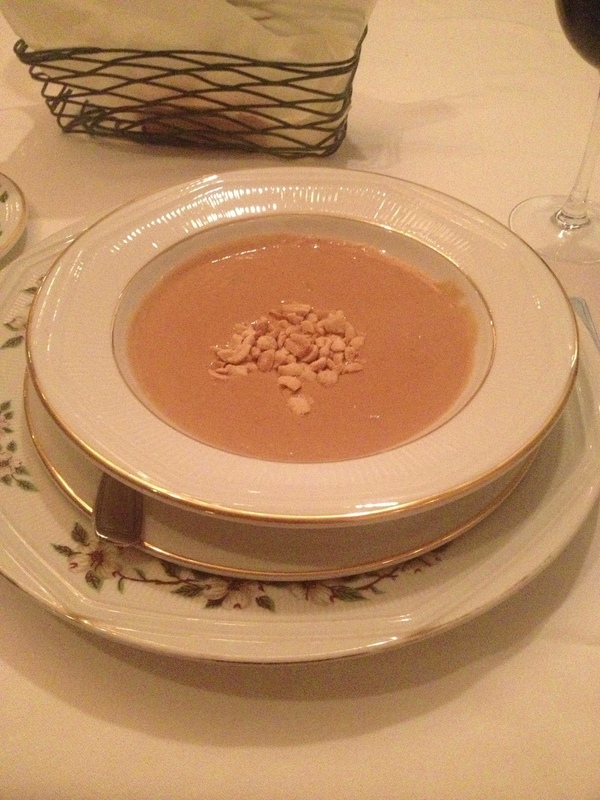 I also tried a sampler portion of the Peanut Soup as my second course. The menu describes this as a "Hotel Roanoke heirloom recipe". Given that the Hotel Roanoke was built in 1882, that translated to me into "recipe that has been perfected over many years" so I needed to try it. Again, it was really, really good. One other thing that bears mentioning is that the asiago cheese bread they serve at the restaurant could be a meal by itself. I love cheese bread and this was some of the best I've had. 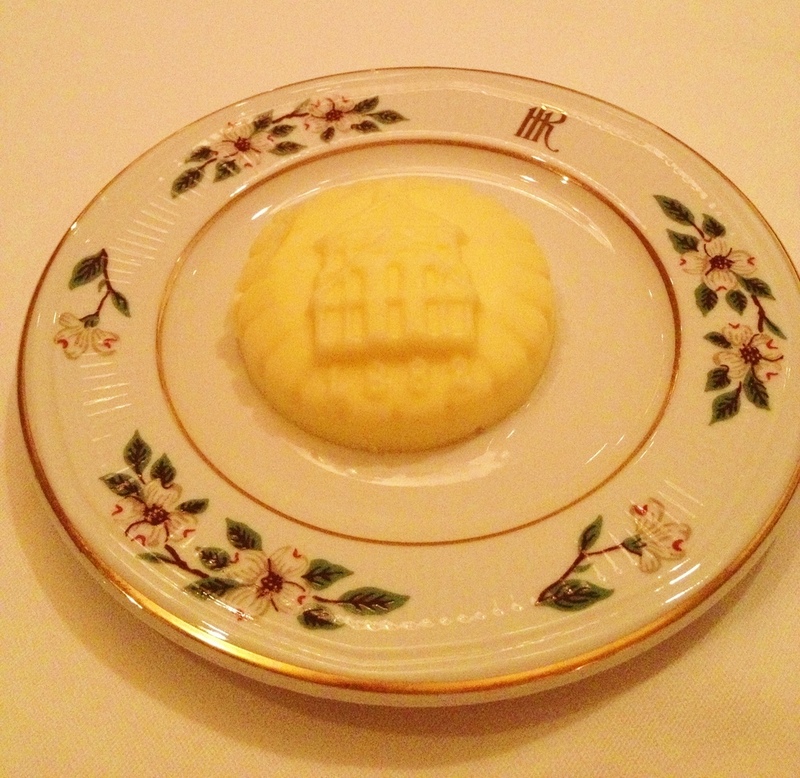 They even had butter with the hotel on it. Bonus points. For my entree, I ordered the Grilled Filet Mignon. The menu's description on this one states: "gorgonzola-tomato butter, herb roasted fingerling potatoes, and sautéed asparagus". I ordered my steak rare and the temperature on the steak was perfect. Bonus points to the chef for mixing white and green asparagus. I initially thought there might be too much of the butter on the steak, but then I realized it tasted great on the vegetables and on the aforementioned cheese bread so I can't take off points for that. I don't always order dessert at restaurants. Usually I'm too full and I do try to at least be somewhat healthy on the road (to varying degrees of success). 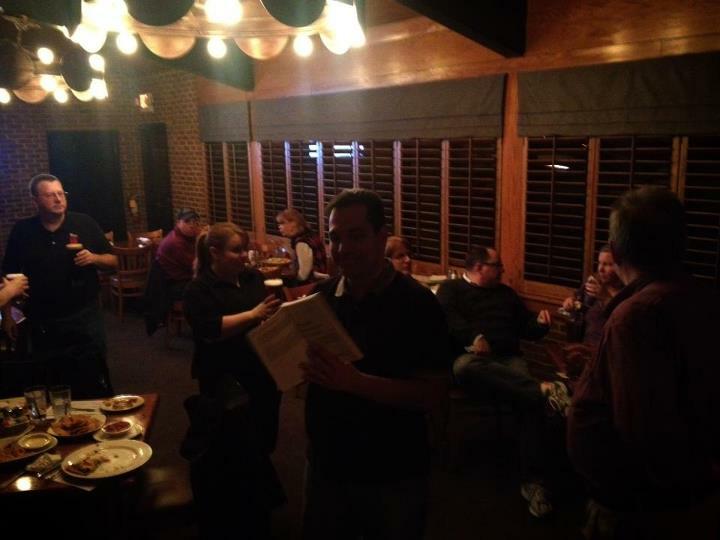 The mission on this dinner outing was to spend $50 so I could get 1,000 bonus HHonors points. Turns out I could've done it without dessert but that's a different story. I ordered the Hot and Cold Chocolate Semifreddo because after reading "semi-frozen chocolate mousse, dark chocolate brownie, mocha chocolate soup" I don't know how anyone avoids ordering this. I told the waiter it should be illegal, to which he promptly replied it was...in three states. I almost believe him. I also ordered a cappuccino. I was informed by the waiter that it was the first cappuccino he's ever made. He has a bright future ahead of him...it was perfect. This was a great meal and with the coupon I had for a free appetizer it was fairly reasonably priced. I would highly recommend it if you are ever in the Roanoke area. This is especially true if you stay at the Hotel Roanoke and are a HHonors menu since they will give you the coupon and the bonus points voucher. I believe that deal is valid through August 31, 2013. Enjoy! I've moved my site from tumblr to Squarespace 6 and I couldn't be happier. Love how easy it is to do really interesting things. For those of you that didn’t know anything about Joe Paterno until you heard about him through the scandal can read that and maybe understand even a tiny little bit why he means a lot to us. That word “family” is appropriately placed in that quote. It’s a very sad day. Joe Paterno was not only a great football coach but a maker of men and great contributor to Penn State. History will remember this man not for a perceived inaction in the response to the actions of another man, but for a great legacy at Penn State. Joe and his wife were consistent donors to Penn State including $13.5 million towards the expansion of the Patee Library (the expansion was named Paterno Library). As a graduate of Penn State, my education was made better by this man. He will be missed. This is also a glowing reminder to give lots of support to anyone you know with cancer — even treatable forms. Joe Paterno died not from a treatable form of lung cancer, but an utterly broken heart. 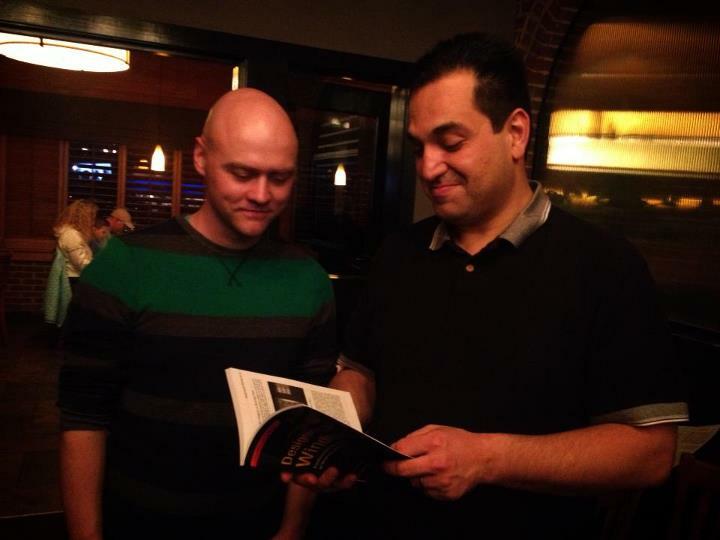 Ways to workaround some shortcomings of the current Metro WebView control in XAML/C#. The Boycott GoDaddy movement is a good opportunity to shine a light on a fabulous domain name service, Hover. If you’re moving from GoDaddy you will appreciate the easy domain name transfer and uncluttered purchasing experience. They won’t send you through a gauntlet of up-selling attempts and they include private registration for free. The transfer will cost $10 and includes extending your domain registration for a year. Give Hover a try today!